There has been a lot of attention in the press and blogosphere about the worrisome situation in Libya, the (in)adequacy of the United States' and United Nations' response thereto, and the Security Council's unanimous referral of the situation to the International Criminal Court via Resolution 1970 on February 26, 2011. (See our prior coverage here). On March 2, 2011, the ICC Prosecutor announced that he had opened his investigation into potential crimes committed in Libya (see his press conference here). The President of the ICC, Judge Sang-Hyun Song (S. Korea), thereafter assigned the situation to Pre-Trial Chamber I. In undertaking his investigation into international crimes committed since February 15th, the ICC Prosecutor has already signaled that he will consider the commission of crimes against humanity—a constellation of acts made criminal under international law when they are committed within the context of a widespread or systematic attack against a civilian population with knowledge of that attack. Certainly the strafing of peaceful demonstrators with helicopter gunships, the indiscriminate bombing of residential neighborhoods by warplanes (left, photo credit), and the unleashing of mercenaries and snipers on the ground collectively rise to the level of such an attack. This is especially true given that at least a thousand people have been killed and thousands others have been injured and/or displaced. (Although, I should note that Judge Kaul, who does not sit on this PTC, will likely disagree here). War crimes may also have been committed, depending on whether the situation in eastern Libya or elsewhere rises to the level of armed conflict. Common Article 3, whose prohibitions are listed as war crimes in Article 8(2)(c) of the ICC Statute, is applicable once there is an "armed conflict" occurring "on the territory of" a party to the Geneva Conventions. The determination of when violence rises to the level of an "armed conflict" depends on the level of violence and the degree of organization of the parties. Certainly, the formation of an increasingly hierarchized and united armed opposition—populated and led by courageous defectors from Libyan armed forces' officer corps—goes far toward finding the necessary degree of organization. In addition, there are indications that swaths of the country are under the control of opposition groups forging a transitional government (the Libyan National Council) after governmental authorities collapsed. which take place in the territory of a High Contracting Party between its armed forces and dissident armed forces or other organized armed groups which, under responsible command, exercise such control over a part of its territory as to enable them to carry out sustained and concerted military operations and to implement this Protocol. of internal disturbances and tensions, such as riots, isolated and sporadic acts of violence and other acts of a similar nature, as not being armed conflicts. There thus may be reasonable grounds to conclude the existence of a full-scale civil war, albeit an unbalanced one according to comparative military assessments, which would lay the groundwork for war crimes charges. The crime of aggression is not immediately implicated in the Libyan situation. For one, the aggression amendments will not come into force until 2017 at the earliest. Moreover, the definition of the crime does not envision the act of aggression being committed by or against non-state actors that are not linked to a state. 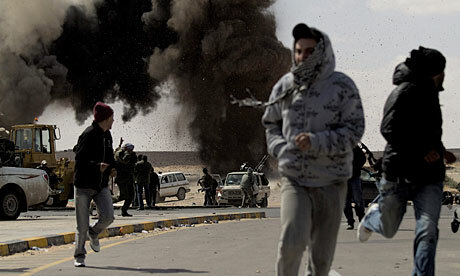 Nonetheless, the crime of aggression may bear on responses by the international community to the crisis in Libya. Indeed, military options are not off the table, according to recent comments by President Obama and other world leaders. In particular, it has been proposed that the international community—or some subset thereof—should impose a no-fly zone over the country in an effort to prevent Libya's increasingly erratic and vicious leader from committing further violence against his own people. The Gulf Cooperation Council and Arab League reportedly support such a measure as do several vocal members of Congress. France and Britain are working on a draft Security Council resolution that would authorize such a response, although it is unclear if Russia and China would support this measure, which sounds of military intervention. This raises the prospects that a group of states, such as NATO or some other coalition of the willing, might move forward without explicit Council approval. This is exactly the kind of scenario that worries detractors of the codification of the crime of aggression in the ICC Statute. the Security Council (which also acts as a filter to aggression charges and can defer prosecutions for a renewable period of a year). In any case, the ICC is poised to enter the debate about such humanitarian interventions in the event that they occur once the aggression amendments are operational. The situation in Libya offers yet another potential scenario in which a deployment of armed force might be warranted and beneficial, but may not—for whatever reason—be able to garner Security Council approval.